How Much Money Can Be Borrowed From a Roth IRA? 1. Can Funds Be Taken Out and Put Back in a Roth IRA? 2. Can an IRA Distribution Be Put Back? 3. When Can You Take Distributions From a Roth IRA? Borrowing money from your retirement savings may be counterintuitive to your overall investment goals. But when “life happens” and unforeseen expenses tug at your cash flow, you may find yourself casting a tentative glance at your retirement account. Even though you’ve set up your retirement plan as a long-term future benefit, your short-term financial situation may turn that tentative glance into a firm stare. If your retirement savings portfolio includes a Roth IRA, and you want to borrow funds from it, you’ll have only two months to repay the funds. Otherwise, you’ll have to be content with making a permanent withdrawal instead of taking a temporary loan. Strictly speaking, you can’t borrow from a Roth IRA in the same way you would from a traditional lender. You can, however, withdraw funds from your Roth for a period of 60 days before returning them to your account. This return is called a "rollover." And if you meet a few guidelines, you can do this tax-free and penalty-free. But you can only perform this maneuver once every 12 months. 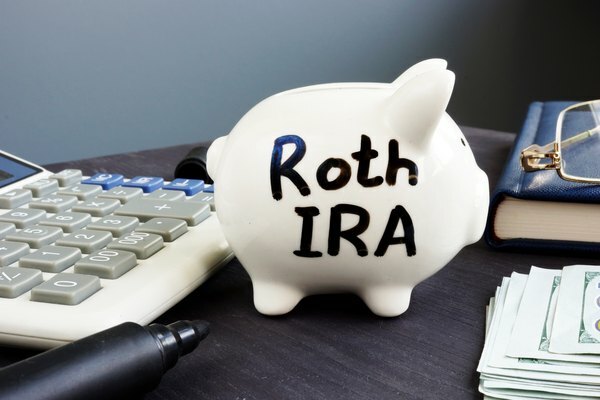 If you cannot repay your Roth IRA within 60 days, the temporary "loan" becomes a permanent withdrawal, which is subject to certain Roth IRA withdrawal rules. The money in your Roth IRA consists of two components – the amount you contribute to the account (your contributions) and the amount of interest that the account earns (your earnings). You can withdraw any amount of the contributions you’ve made to your Roth IRA account at any time, tax-free and penalty-free. These withdrawals are called distributions. But if you take an early distribution of your earnings, which means you withdraw any of your earnings before you’ve had your Roth IRA for at least five years and you’re younger than 59 ½ years old, you’ll have to pay a 10 percent penalty on top of the income tax assessed on the amount of earnings you withdraw. One reason you may be considering borrowing from your Roth IRA is that you want to buy a new house. One exception to the early earnings distribution penalty meets this scenario. You can use a Roth IRA withdrawal for the purchase of a home if you are buying, building or rebuilding your first house. You may not have to pay the 10 percent penalty for any unqualified earnings distributions you take for this purpose. Other than purchasing a new home, the IRS allows numerous other exceptions that are exempt from the 10 percent penalty for early distributions of unqualified earnings. You’re permanently and totally disabled. You inherited a Roth IRA as the beneficiary of a deceased account owner. You need to pay unreimbursed medical expenses that exceed more than 7.5 percent of your adjusted gross income for the tax year. You need to pay medical insurance premiums while you’re unemployed. You receive a qualified reservist distribution. IRS Publication 590-B (Distributions from Individual Retirement Arrangements [IRAs]) explains more exceptions to early Roth IRA distribution penalties. Visit IRS.gov/forms and search for this publication by number to view, download or print it. The IRS allows only earned income as a funding source for Roth IRAs. This means that you can contribute the income you make from working to your Roth IRA (such as wages, salary, self-employment income, tips and commissions) but not your unearned income (such as dividends, interest and pensions). The IRS does allow you to contribute two sources of unearned income to your Roth IRA – taxable alimony and separate maintenance payments. Your annual income and IRS tax filing status are the determining factors for whether you’re eligible to have a Roth IRA. But you’ll first have to figure your modified adjusted gross income to determine your eligibility. Visit IRS.gov/forms and search for Publication 590-A (Contributions to Individual Retirement Arrangements [IRAs]). Inside this publication, you’ll find Worksheet 2-1 (Modified Adjusted Gross Income for Roth IRA Purposes). This worksheet is a form that walks you through a step-by-step line-item calculation to figure your modified adjusted gross income. Then, check your tax filing status to see if your modified adjusted gross income is within the allowable limit to contribute to a Roth IRA. Married filing separately. If your modified adjusted gross income is less than $10,000, and you lived with your spouse for any part of the tax year, you can only contribute a reduced amount to your Roth IRA. Married filing jointly or qualifying widow(er). If your modified adjusted gross income is less than $189,000, you can contribute up to the maximum limit. If your income is greater than or equal to $189,000 (but less than $199,000), you'll only be able to contribute a reduced amount. Married filing jointly or qualifying widow(er). Your modified adjusted gross income is less than $193,000, you can contribute up to the maximum limit. If your income is greater than or equal to $193,000 (but less than $203,000), you'll only be able to contribute a reduced amount. If you pass the income requirement that allows you to contribute to a Roth IRA, it doesn't mean you're allowed to contribute an unlimited amount each year. If you exceed the maximum IRS-allowable contribution limit, you may have to pay a penalty. The maximum contribution limits are subject to change from year to year as tax laws change. From 2015 through 2018, the maximum Roth IRA contribution limit is $5,500 ($6,500 if you’re 50 years of age or older). For tax year 2019, this limit increases to $6,000 ($7,000 if you’re 50 years of age or older). These contribution limits include the total combined contributions for your Roth IRA plus any traditional IRAs you may have. You cannot contribute an amount that’s more than your annual taxable income. Tip: Maximum contribution limits do not apply to any rollover contributions, which include the amounts you may repay your Roth IRA during the 60-day penalty-free period. If you’re only eligible for a reduced contribution instead of the maximum allowed, you’ll have to figure the exact amount you can contribute. Find Worksheet 2-2 (Determining Your Reduced Roth IRA Contribution Limit) in IRS Publication 590-A by visiting IRS.gov/forms and searching for this publication. Complete the worksheet to find the maximum contribution you’re allowed to make to your Roth IRA. Investopedia: How Can You Borrow from a Roth IRA? Can I Contribute to Both Types of IRA Accounts? Can I Cancel a Roth IRA Contribution for the Year? Can Employees Open an IRA? Can My Roth IRA Own Stock in My Company?